If you want to be a top reseller, you need to know your customers and their issues. Feedback statistics are therefore crucial for the optimization of your services. You can get an overview of the clients generated per store and your current profit via your Reseller Reports menu. In addition, you have a list of your clients and the orders they have made. We have made available detailed payment history for your convenience. This section allows you to get a quick overview of your hosting business via numerous parameters. Statistics allow you to optimize your performance and increase your profits. Allows you to follow-up your business performance in details, so that you can manage it optimally. This section allows you to quickly view all your affiliates and their performance. This section shows you a list of your clients, their respective contact details, hosting plan and the plan’s expiration date . This section allows you to easily track the orders of your stores. 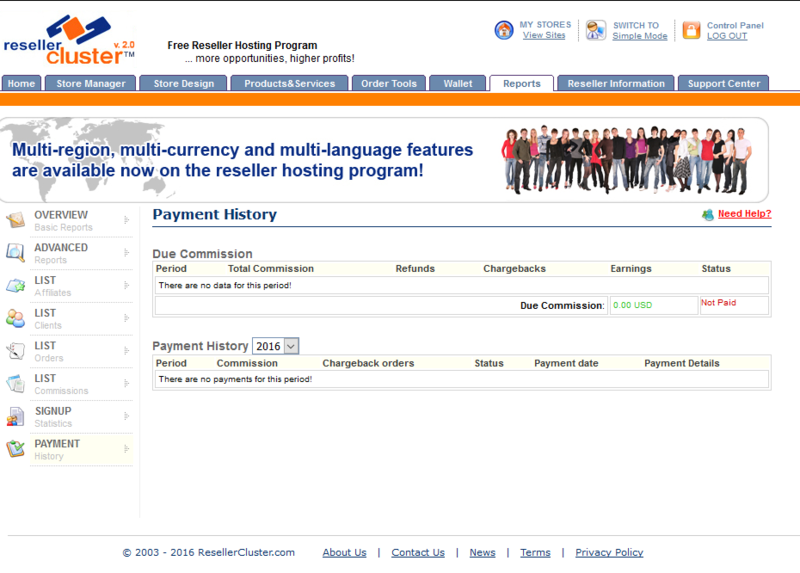 This section gives you an overview of your monthly commissions since your start at ResellerCluster. This section allows you to keep track of your daily, monthly and annual sign-ups. Allows you to easily view the payment history of your reseller business profits. You can see all payments already payed off to you, as well as the current due profits.